(AFP) -- It may sound like science fiction, but the prospect that suicide bombers and hijackers could be made redundant by flying robots is a real one, according to experts. The technology for remote-controlled light aircraft is now highly advanced, widely available -- and, experts say, virtually unstoppable. Models with a wingspan of five metres (16 feet), capable of carrying up to 50 kilograms (110 pounds), remain undetectable by radar. And thanks to satellite positioning systems, they can now be programmed to hit targets some distance away with just a few metres (yards) short of pinpoint accuracy. Security services the world over have been considering the problem for several years, but no one has yet come up with a solution. "We are observing an increasing threat from such things as remote-controlled aircraft used as small flying bombs against soft targets," the head of the Canadian secret services, Michel Gauthier, said at a conference in Calgary recently. According to Gauthier, "ultra-light aircraft, powered hang gliders or powered paragliders have also been purchased by terrorist groups to circumvent ground-based countermeasures." On May 1 the US website Defensetech published an article by military technology specialist David Hambling, entitled "Terrorists' unmanned air force". "While billions have been spent on ballistic missile defense, little attention has been given to the more imminent threat posed by unmanned air vehicles in the hands of terrorists or rogue states," writes Hambling. Armed militant groups have already tried to use unmanned aircraft, according to a number of studies by institutions including the Center for Nonproliferation studies in Monterey, California, and the Center for Arms Control, Energy and Environmental Studies in Moscow. 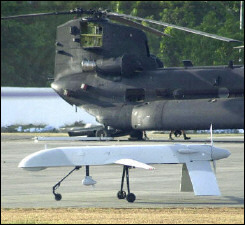 In August 2002, for example, the Colombian military reported finding nine small remote-controlled planes at a base it had taken from the Revolutionary Armed Forces of Colombia (FARC). On April 11, 2005 the Lebanese Shiite militia group, Hezbollah, flew a pilotless drone over Israeli territory, on what it called a "surveillance" mission. The Israeli military confirmed this and responded by flying warplanes over southern Lebanon. Remote-control planes are not hard to get hold of, according to Jean-Christian Delessert, who runs a specialist model airplane shop near Geneva. "Putting together a large-scale model is not difficult -- all you need is a few materials and a decent electronics technician," says Delessert. In his view, "if terrorists get hold of that, it will be impossible to do anything about it. We did some tests with a friend who works at a military radar base: they never detected us... if the radar picks anything up, it thinks it is a flock of birds and automatically wipes it." Japanese company Yamaha, meanwhile, has produced 95-kilogram (209-pound) robot helicopter that is 3.6 metres (11.8 feet) long and has a 256 cc engine. It flies close to the ground at about 20 kilometres per hour (12 miles per hour), nothing but an incredible stroke of luck could stop it if it suddenly appeared in the sky above the White House -- and it is already on the market. Bruce Simpson, an engineer from New Zealand, managed to produce an even more dangerous contraption in his own garage: a mini-cruise missile. He made it out of readily available materials at a cost of less than 5,000 dollars (4,000 euros). According to Simpson's website (www.interestingprojects.com/cruisemissile), the New Zealand authorities forced him to shut down the project -- though only once he had already finished making the missile -- under pressure from the United States. Eugene Miasnikov of the Center for Arms Control, Energy and Environmental Studies in Moscow said these kinds of threats must be taken more seriously. "To many people UAVs (unmanned aerial vehicles) may seem too exotic, demanding substantial efforts and cost compared with the methods terrorists frequently use," he said. "But science and technology is developing so fast that we often fail to recognise how much the world has changed."